Money-Wiring Fraud, a photo by timtak on Flickr. Fraudsters in Japan phone up old people, and not so old people, and persuade them to wire them money. Fraudesters targetting people in the USA and the UK, also attempt to have their victims wire them money. They often attempt to do this by telling us anglophones that we are very lucky and can come into a massive fortune if we just pay a few thousand dollars/pounds to smooth over the paper work. Japanese "Furikomi" fraudsterson the other hand, phone up saying "its me, I have had a car crash, please help." The fraudster waits till the person on the other end of the line guesses a name ("Is that you Ichirou? "), says yes, says that he needs some money urgently and to go the bank to wire it straight away. 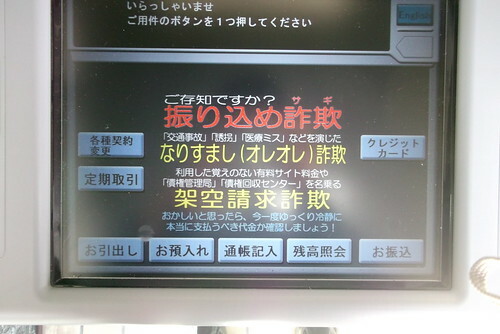 Hence the warnings on Japanese automatically telling machines warning the user against"Its me, me" Fraud. There in Japan the fraudesters are playing on the assumption that the victims think that they or their relatives are unlucky and that other people depend upon them. Westerners over estimate their luckiness, chosen-ness, uniqueness, where as Japanese over estimate the extent to which they are embedded in their social networks and that other people depend upon them.